My father and stepmother got back into gardening this last year, in a big way. The garden was huge, and featured such a number of varieties, from lettuces to squash to tomatoes, that it would be hard to list them all here. All summer and fall, they served garden fare to their many guests. And as the season progressed, they went into “canning mode”, and preserved so many wonderful products from their garden that it puts a Harry and David’s to shame. On Christmas day, we were treated to one of the nicest, most thoughtful gifts we have ever received: In a large tub, they presented us with many containers of their preserved garden treasures – fruit vinegars, pickles, sauces and all manner of preserved vegetables and fruits. It is a treasure, as Linda is a great cook and I know that each jar will be a gustatory treat. I know many of you (and me!) are getting back into gardening for many reasons – it’s green, it’s cost effective, and it’s great therapy for the frazzled person. 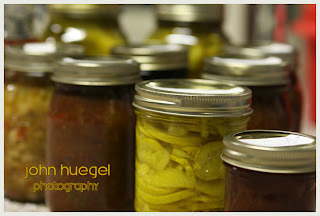 While you’re at it, brush up on those canning skills and think about putting up some food in 2009. Whether you grow your own, or pick up the produce from one of Erie’s many great growers, the satisfaction of serving and giving from your own bounty is great.